Resolution of force may involve the splitting of a force into many of its parts, without altering its influences on the body. Generally, the resolution of force is carried out along two mutually perpendicular paths. It states – “The algebraic sum of the resolved components of a number of forces, through a given path, is equal to their resultant resolved part in the same direction." Referring to the figure, consider a couple of forces denoted as P and Q. Let the forces be represented in magnitude and direction through the sides OA and OB of the shown parallelogram respectively. Here, it’s known that the diagonal OC represents the resultant of the two forces P and Q in magnitude and direction. Let OX represent the direction needed for resolving the forces. 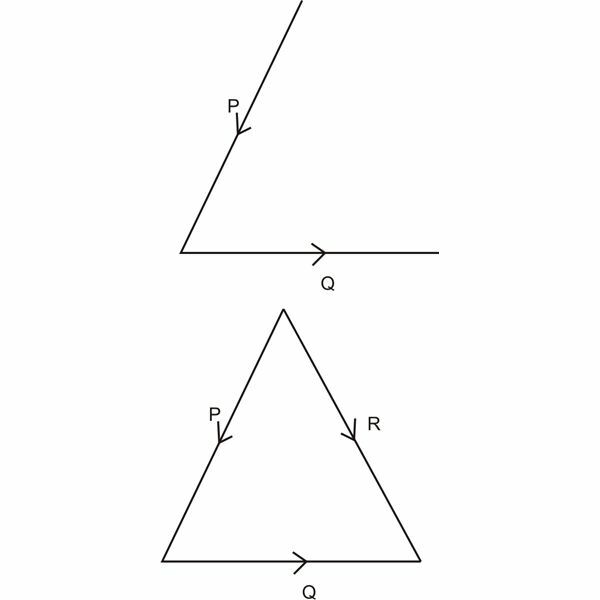 Drawing from the points A, B and C on OX, perpendicular lines AL, BM and CN, also from point A another perpendicular line AT on CN, we get two triangles OBM and ACT. The two sides AC and OB are same in magnitude and are parallel. Also, OM is parallel to AT. Therefore, OM = AT = LN. The geometry of the drawing suggests, ON = OL + LN = OL + OM, since LN = OM. However, ON is the part that’s resolved of the resultant R.
Similarly OL is the part resolved of P and OM of the force Q. Therefore, finally we get the resolved part of OX and R = Resolved part of P along OX + Resolved part of Q along OX. In the above example, for the sake of easier understanding, we took just a couple of forces; however the concept may be applied for any number of forces. Resolve the given forces vertically and calculate the algebraic total of all the vertical parts or Σ V.
Resolve the given forces horizontally and calculate the algebraic total of all the horizontal parts or Σ H.
It states – “If a couple of forces applying simultaneously on a particle is represented in direction and magnitude taken in order by the two sides of a triangle, then their resultant can be represented in direction and magnitude by the third side of the triangle, taken in the reverse direction. Consider two forces P and Q (see fig) acting over a common point, then by closing the remaining side of the triangle we get the resultant of the forces as R, with opposite orders. It states – “If several different forces applying simultaneously over a particle be represented in the order of direction and magnitude by the sides of the polygon, then the resultant of the entire forces can be represented in the opposite order of direction and magnitude by the closing side of the polygon." 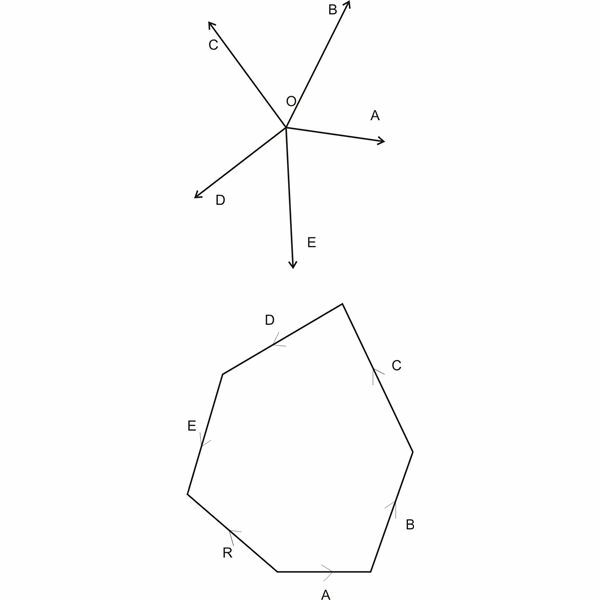 The figure illustrates five forces A, B, C, D and E, with arrows indicating their directions. The next figure provides the resultant of the five forces by R, which is the closing side of the polygon, but in the opposite direction, again shown by the arrowheads. The vector method provides an alternative method of calculating resultant force graphically, using polygon law of forces. 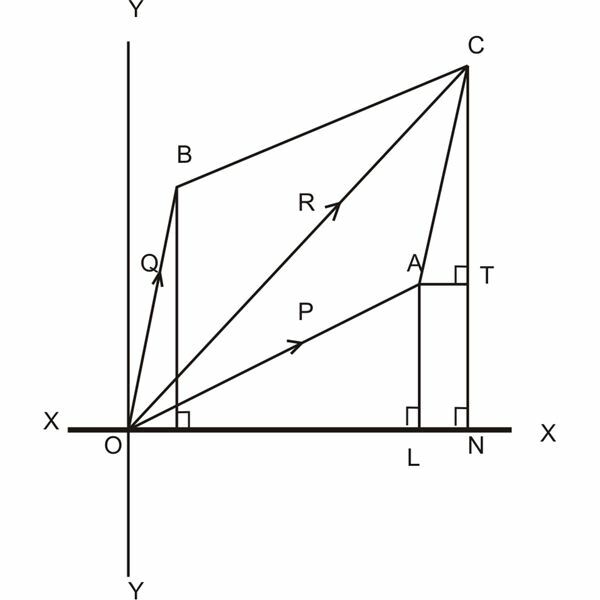 Draw the space diagram for the given forces. Next, choose an appropriate location and continue adding the forces vectorially with regard to the directions of the forces. Then the sides of the polygon which closes the figure, taken in the opposite direction to its adjoining forces, gives the direction and the magnitude (as per the scale) of the resultant of the forces.